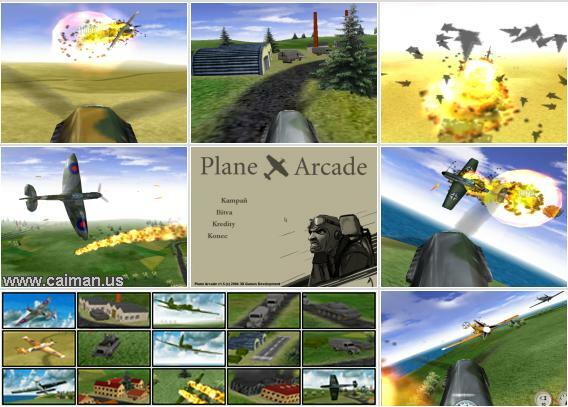 Caiman free games: Plane Arcade by Peter Adamcik, Simon Meszaros - 3D Games dev..
4. You haven't any munition! Just fly over the convoy and return to your base. 8. Shoot the two bombers down. Watch out for the tanks and fighters. 9. Destroy the tanks and watch out for the fighters, they come up 2 by 2. 10. Same, destroy all the tanks, but now there are many more fighters in the air. 11. 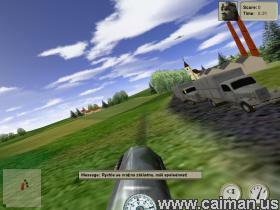 An air combat, but this time you only can use the Third Person View. 12. Destroy the tanks in the city,.. and of course many fighters again. 13. Take the bombers out. They are escorted by fighters. 14. Shoot the bombers down before they destroy your city. Watch out for the tanks and fighters everywhere. 15. Final fight: dozens of fighters want to take you out. As you can see in the screenshots, the graphics are great. There is good sound and most important the controls and the gameplay are great! Thanks to Andre Fluitman who made a translation into Dutch. 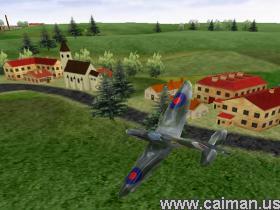 Een grafisch mooie vluchtsimulator van een Spitfire. Gemakkelijk te besturen. Het spel is in het Tsjechies, hieronder uitleg van enkele begrippen. 14. Haal de bommenwerpers neer voor ze jouw stad vernietigen. Wil je alle 15 missies in een keer ontsluiten open dan het bestand Menu\array.dat met Notepad of een andere ASCII-editor (niet met Word!) en verander het nummer in 15. Opslaan, wanneer je het spel weer start kun je alle missies spelen. Nadat je Plane Arcade gewoon installeerd (of uitgepakt) hebt, download PlanearcadeNL.exe en start het, dan moet het werken.